The steel-and-aluminium Ann G exceeded her contractual speed by 0.6 knots, reaching 15.6 knots. “Ann G’s owner is a client with strong vision and high expectations. We are very pleased with the result as Ann G is the quintessence of customisation and superb attention to detail, She is a muscular yet sleek motor yacht that will make heads turn wherever she goes!” says a representative of Arcon Yachts, who project-managed the build. 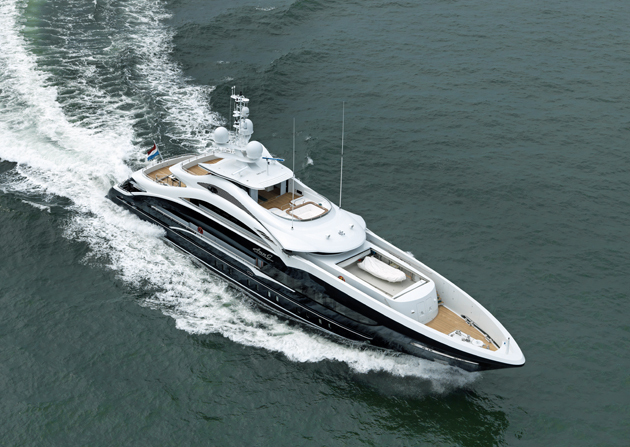 Exterior designer Clifford Denn interpreted the client’s brief for a yacht with a powerful and aggressive personality. Reymond Langton Design’s interior is characterised by rich macassar ebony, accented with stainless steel features with warming touches of backlit white onyx and tactile leather. A keynote element is a bespoke Art Deco-style chandelier extending over two decks and framed by the stairs, while the main-deck salon sports an inlaid feature artwork by Based Upon. The owner’s suite, forward on the main deck, features a private office, and a full-beam bedroom and bathroom flanked by his’n’hers changing rooms. The sky lounge has an informal, intimate atmosphere with the macassar architecture of the room contrasting with parchment wall panels and opulent fabrics. A lower deck beach club is in a contemporary style, with gym equipment, steam room, bar and seating area. The main woods in this area are elm panelling and teak flooring.